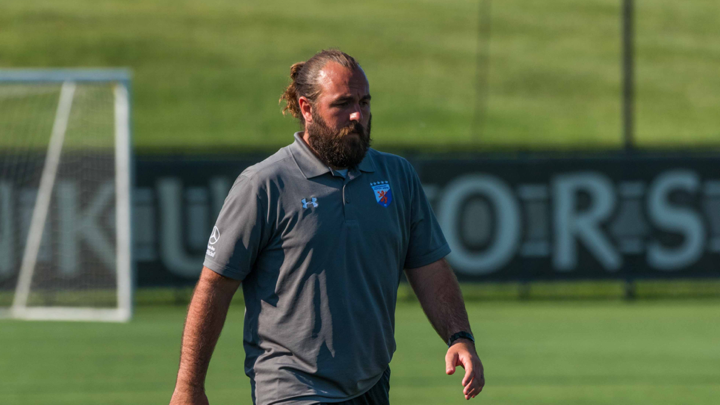 Brandon Ponchak has been the GM for Cincinnati Dutch Lions FC since 2017. We talked to Brandon about what he does, the development of the club and the expectations for the upcoming season. DLFC: Who is Brandon Ponchak and where are you originally from? BP: I am originally from McConnelsville, Ohio, a rural town in southeast Ohio. I was born and raised there, and my whole family still lives there. DLFC: What is your background in soccer before you joined Cincinnati Dutch Lions FC? BP: Before I came to CDLFC in 2017, I had been a college coach for three different colleges (Sterling College in Kansas, Bluffton University in Ohio, and Dakota Wesleyan University in South Dakota). I knew I was going to get into coaching when I first worked for the Charlotte Eagles (USL Pro) in 2007-2008 as I finished up college. DLFC: How did you get involved with Dutch Lions FC? BP: I initially became involved with Dutch Lions FC when I was with Bluffton University in 2011. I was a young coach just wanting to learn more. I had studied the Dutch philosophy and reached out to the Dayton Dutch Lions FC when they were USL Pro. Coach Ivar van Dinteren brought me in to help with the pro trials and I served as the play-by-play/commentary team for the USL live streams on YouTube for two years. Those two years were very impactful in my coaching career and development. DLFC: What are your main responsibilities and tasks as GM of Cincinnati Dutch Lions FC? BP: As the GM for CDLFC, I am responsible for running the Club under the direction of majority owner Hans Philippo and president Bob Rack. Marketing, ticketing, equipment purchases, scouting, club development, sponsorships, and many more tasks fall under my duties. DLFC: What do you enjoy most in your job? BP: The most enjoyable part of the job is working with high-level players who truly want to chase their professional soccer dreams. Additionally, the days are always different, so the job doesn’t seem to just be monotonous. DLFC: How would you describe working for the club and its ownership? BP: The ownership has made CDLFC an absolute dream job to work at. They want to win. They want to be successful. They want to impact the Cincinnati and Northern Kentucky soccer scene. It’s truly a place that allows players to develop and chase those #Path2Pro dreams that USL2 is built on. It shows, as we have helped 12 players in 5 years go pro. DLFC: Looking back at the beginning when you just joined and today, what are the main developments that you see with the club? BP: A few of my goals when I joined was to grow the Club’s awareness in the area and increase our scouting to help produce professional players. Since new ownership has taken over (January 2017), there has been 8 of our 12 pro signings happen. One of my favorites was goalkeeper Zeus de la Paz signing with Oldham Athletic FC, who was in England League One at the time. The Club growth has been amazing, we’ve developed great relationships with local clubs, increased our social media presence greatly, added live streams for our home matches, and have even began bringing in interns to help our Club and their own careers in sport. Bringing in a former professional to be our Head Coach, Paul Nicholson, has been great for our Club and my own development in soccer too. DLFC: In 2018 the team had a rough start (2 points after 4 games) but then came back strong and even competed until the end for the Conference Championship. How do you look back on last years’ season? BP: Last year’s season was definitely hindered by a frustrating start. We had loads of talent, and it didn’t seem like the ball would bounce our way when we needed it to. Although it wasn’t the start we wanted, we were able to turn it around and even had a chance to win the division had we had a better result in our second-to-last match. I’ve never had a season where 4 matches had weather-related issues too, which can disrupt the mentality and flow of the season. DLFC: What have you done differently this year to get ready for the new season? BP: One of the main aspects we changed is scheduling. We tried to get a few matches earlier in the season, so we didn’t have a real heavy back-ended schedule congestion. But, probably the biggest change was scouting and recruiting. We’ve developed some good relationships with some other pro teams, scouts, and agents that have afforded us a great network for player identification. Through this change in scouting, we are able to get more players who want to be playing with us and USL2. They come from areas and coaches who value what we are doing and know the importance of playing in the best amateur league in the US, and our division is the best in the league. DLFC: The team has a very experienced and knowledgeable staff with Paul Nicholson, Jack Hermans, Terry Nicholl and yourself. How do you describe working with them? BP: Our coaching staff is extremely fun. The experiences that everyone brings helps the staff grow and players develop. There’s never a dull moment when there’s two Englishmen, a Dutchman, and an American together – it’s almost like the start of a joke. Terry and Jack are legendary in the Cincinnati soccer community. DLFC: What are the expectations for the 2019 season? BP: Expectations are no different than previous seasons, make postseason and a run for the National Championship. Additionally, we always want to get our guys as much exposure with pro teams, scouts, or agents while also enjoying a great summer in Cincinnati with like-minded players. DLFC: FC Cincinnati has been highly successful in the Cincinnati and US soccer market. What does that mean for Cincinnati Dutch Lions FC? BP: Soccer is brought to the forefront in the region. There is a lot of kids playing in the area, and both organizations (FCC and CDLFC) aim to provide great experiences for the local soccer community. We have a great working relationship with FCC, and we only expect it to grow stronger. DLFC: Why should people come and support the team in their home games? BP: Home games at NKU are enjoyable for people of all ages. Our home venue is great to watch matches at, interact with staff and players, and the opportunity to see some future professionals. It is affordable for anyone to attend and does not truly conflict with any other sporting events in the area. We look forward to growing our gameday experiences and fans.